A special character unique to Daoists texts and talismans. Wu is indeed the simplified form of wu, but it was also an ancient character that had the same significance, i.e., nothing, negation, absence of, etc. However, is not, precisely the component of . If you look closely you'll see an additional vertical stroke. The component of is ji . Compare the two side by side , and it is clear. 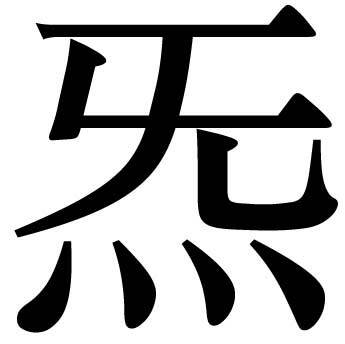 Among the treacheries of Chinese written language, one of the most treacherous is the fact that the addition or deletion of a single stroke or dot can utterly change the meaning of a character. Pity the poor scribes who struggled endlessly with a language requiring such attention to detail. The bottom component is fire, so we don't need to focus too much on that aspect of the character, except to point out that here in we definitely encounter the metaphoric or metaphysical meaning of fire, as it is understood as a member of a set of such metaphor known as wu xing or five phases, elements, agents, and so on. We'll come back to the implications of the presence of fire in once we have examined . What does ji mean? Well, it's a fairly rare character that means...something stuck in your throat, or getting something stuck in your throat, or feeling like there's something stuck in your throat... or there might be or could be. Based upon oral teaching I received in China from Daoist monks on Qing Cheng Mountain outside of Chengdu I believe that in this character what we're seeing is an encoded instruction about the tongue and breathing. The tongue, in qi cultivation practices, is often placed on the roof of the mouth. In this position, pressing gently upwards and forwards into the back of the top teeth, it pulls the throat open a slight bit...just enough to ensure the free passage of any saliva that might fill the mouth during practice. This saliva is a treasure. When the character is read in this way we can see it as a mnemonic for the notion of the union of fire and water, such as is sought in alchemical techniques and methods in order to obtain the ephemeralization of essence, i.e., refining jing into qi, which is the second step of an ancient alchemical formula still taught and practiced by Daoist novitiates. Daoists considered the world as a manifestation of the Great Void, Tai Xu , and this special qi was a vital ingredient in Daoist formula meant as efforts to find the Elixir of Immortality, dan , which we associate with the location and practices known under the rubric dan tian . In this context can be considered as the main way station on the dao of returning to the Great Void . Thus emerged as a special Daoist term, found in magical inscriptions, talismans, and accompanying texts. The aim of these texts and talismans lay often in the domain of self-accomplishment and self-refinement. And the flavor of this character emphasizes that it emanates from an interior realm in which the body's innate treasures serve as the primary ingredients.